I'm not being self congratulatory, but there is something profound going on in the Middle East. 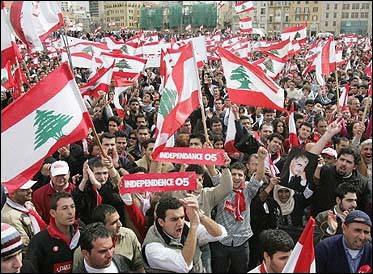 Following the murder of their former leader, the Lebanese people took to the streets. And they took to the streets en masse. It led to the resignation of the Pro-Syrian government, but unfortunately not the President. Today, thousands of Iraqis took to the streets to protest against the local insurgents. It's sort of nice to see Arabs and non-Arabs alike protesting without burning an American flag. I had a great uncle who was Lebanese. That doesn't make me an expert on the region, but I do know that he despised the Syrian occupation and the Syrians for it. It would seem that the Assad regime is ripe to be taken down. Not violently or with our prodding, but by their own people. There is a certain domino effect that is likely to create a movement by people who are on the sidelines while the nations around them reform. One of the amazing things was the remarkably poor attendance at a Pro-Syrian rally. I have to believe that the only people at that rally were people on the Syrian payroll. Oh well, when you live by the sword, you die by the sword. Now get those troops out of the Bekaa Valley!